On the 3rd day of Christmas hertoolbelt sent to you, 3-tier felt tree, a sweater owl and mini-mittens on a little wooden tree. 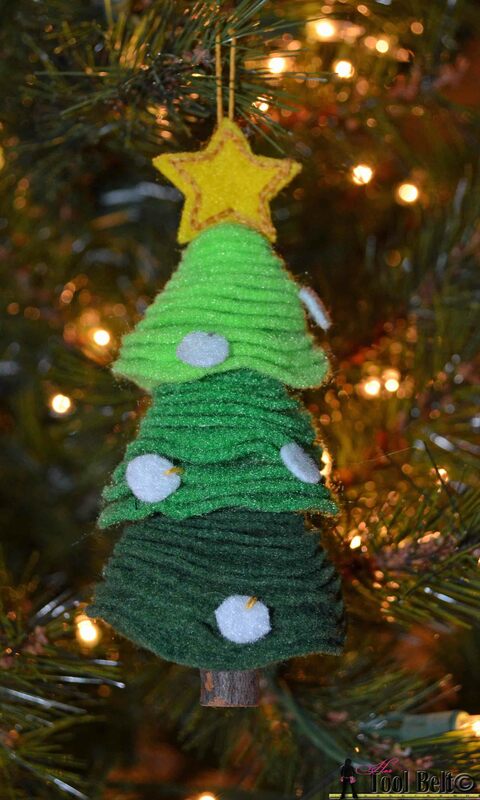 I saw this stacked felt Christmas tree on a friend’s tree last year. I thought it was so cute, I had to make one for my tree. The method is very simple, descending felt circles, stacked and sewn together. The work is a little bit tedious, but the outcome is worth it! Print and cut out the pattern felt stack ornament. I find it easiest to have the pattern on cardstock, so the circles are stiff as I cut around them and the felt. Pick the tree colors of felt that you want to use. For your base tier, cut out a felt circle of each size 2 ½” down to 1”, you will have 13 circles. Stack your felt circles in order. For the middle tier, cut out a circle of each size 2 ¼” down to ¾”, you will have 13 circles. Stack your middle tier felt circles in order. For the top tier, cut out a circle of each size 2” down to ½”, you will have 13 circles. Stack your top tier felt circles in order. For the star, cut out 2 stars from a yellow felt and stitch the 2 stars together. I used a chain stitch (Bucilla embroidery stitch diagram) with golden floss, but use whatever you prefer. Hopefully you have some twigs sitting around outside. Pick a twig that is about ½” diameter and cut it to about 1” long. If you have a drill, drill a small hole through the twig about ¼” from the top. If you don’t have a drill, another option would be to hot glue the tree trunk on after you’ve assembled the tree. Tree assembly: I used 4 strands of embroidery floss (use whatever you have on hand). Using a needle, thread through the tree trunk, leaving excess floss at the end. Make sure your base tier is stacked in a nice cone shape; hold the base stack together and starting on the large circle side run the needle through the center of the felt stack. Repeat for the middle and top tiers. Next run the needle through the middle of the star sandwich, leave a loop of thread at the top of the star and run the needle back down through the star and tree. Adjust the spacing of the tree and star pieces, the felt pieces should be loosely sitting on each other. Tie a square knot with the end of the floss through the tree trunk. Cut out 5 or 6 (½” circles) out of white felt. 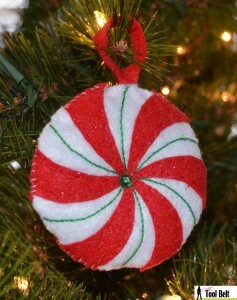 Hot glue or stitch the white ornaments onto the tree. And there you have it, a super cute handmade Christmas tree ornament.